Atlanta doesn’t have a beach, but it does have its own version of the Hamptons. Serenbe, the planned community about 45 minutes south of Midtown in Chattahoochee Hills, is a getaway with all the trappings of a high-end beach town—but instead of the beach, it’s the countryside. 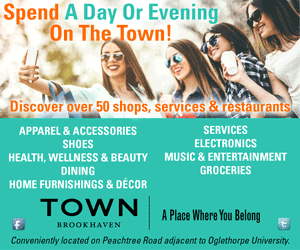 The brainchild of founders Steve and Marie Nygren, the community came about as a way to preserve the Chattahoochee Hills countryside. The founder of Peasant Restaurants, the Nygrens gave up the hustle and bustle of city life and moved to Chattahoochee Hills in the mid-1990s. They renovated a historic farmhouse on the property in 1994, and now 400 residents live and work there. The neighborhoods are called hamlets, each with beautifully designed, eco-friendly homes. Like the Hamptons, not all of the homes are occupied year-round, but a good number are used as weekend destinations. You may not want to buy a weekend cottage, but you can get a taste of the sweet country life without the real estate investment. 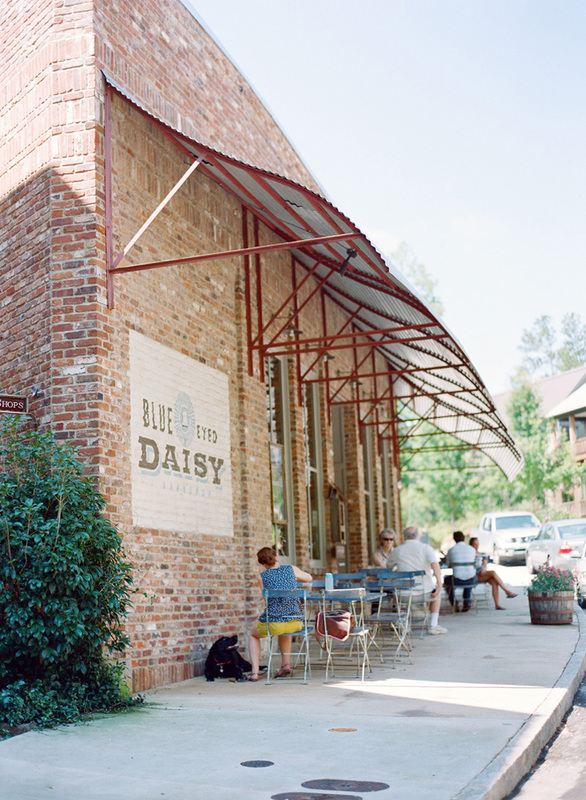 Blue Eyed Daisy serves up fresh, cozy cafe fare. Begin your visit with a stop at Blue Eyed Daisy (blueeyeddaisy.com) for lunch. The cozy cafe serves up sandwiches and salads with organic (when possible) ingredients. Among the standouts is the pulled pork salad with braised pulled pork over mixed greens and shredded cabbage, and topped with crushed peanuts and Thai peanut sauce. Don’t leave without one of the house-made baked goods, such as a black-and-white cookie or classic cupcake. After lunch, browse the high-end clothing boutiques and scope out the art galleries on Selborne Lane, the community’s main thoroughfare. After exploring the footpaths with meditation areas and a stone labyrinth, stroll over to the General Store at Serenbe (generalstoreatserenbe.com) for an afternoon wine tasting. 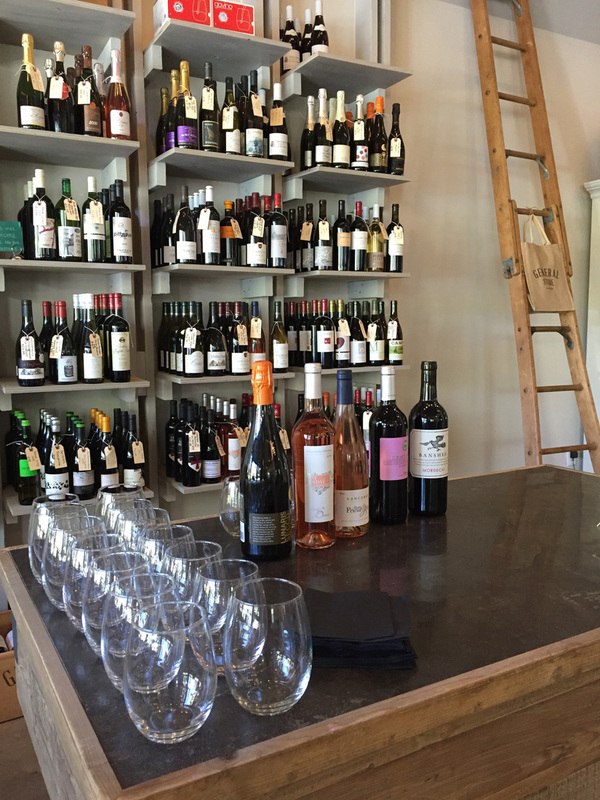 The store is run by Nadine Bratti, a vibrant New York transplant who traded in her sales job to become a wine and food purveyor in Serenbe. On Saturdays she leads the tastings, during which she shares her wisdom along with sips from mostly small, estate-focused wineries. Serenbe has two restaurants with dinner offerings: The Hill (thehillserenbe.com) and The Farmhouse (serenbefarmhouse.com). The Farmhouse offers a dose of bucolic charm that you can’t get in the city. The sunny former home has a patio with outdoor seating, and an airy dining room with a vaulted ceiling, ample windows and white tablecloths. Executive Chef Brian Moll took the helm last summer and continues to turn out seasonal gems in keeping with what’s expected of the 10-yearold restaurant. Standouts on the menu include the Georgia white shrimp with farro and the Carolina gold rice risotto. Much of the produce is sourced from Serenbe Farms, and the menu changes regularly to reflect that. The grounds are no less magical at night. Catch a show at Serenbe Playhouse (serenbeplayhouse.com), which isn’t actually a playhouse at all. The professional theater company performs musicals and plays outside, but the location of the set changes for each show. The summer performances include Peter Pan and Titanic, with perennial favorites Sleepy Hollow and The Snow Queen returning in the fall and winter. Should you want to turn your day trip into an overnight stay, the Inn at Serenbe (serenbeinn.com) offers accommodations adjacent to the Farmhouse with comfortably chic rooms. If you want to feel more immersed, rent rooms in cottages and townhomes throughout the community. 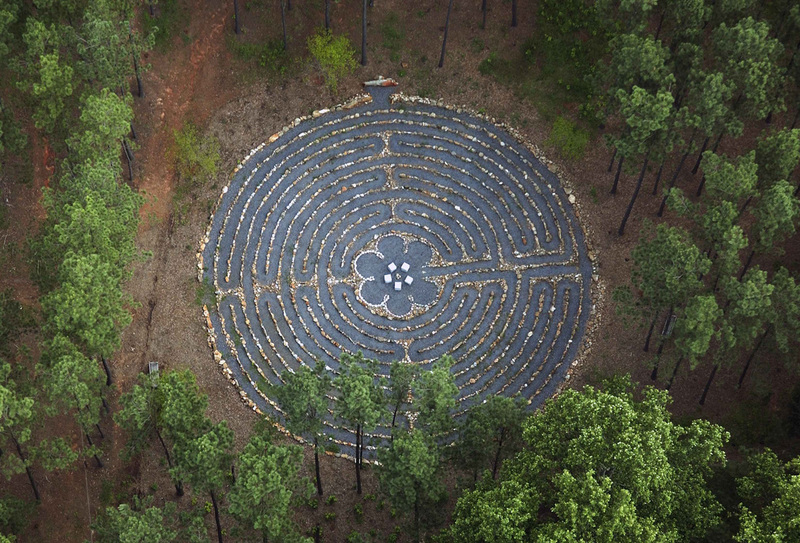 Try to find your way out of the property’s stone labyrinth.